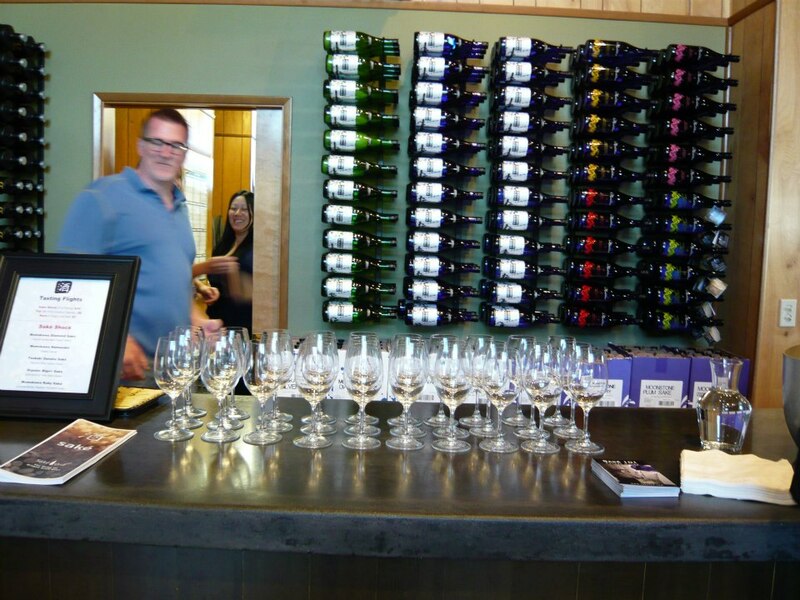 I was in Portland, Oregon August 14-21 for the Wine Bloggers Conference. 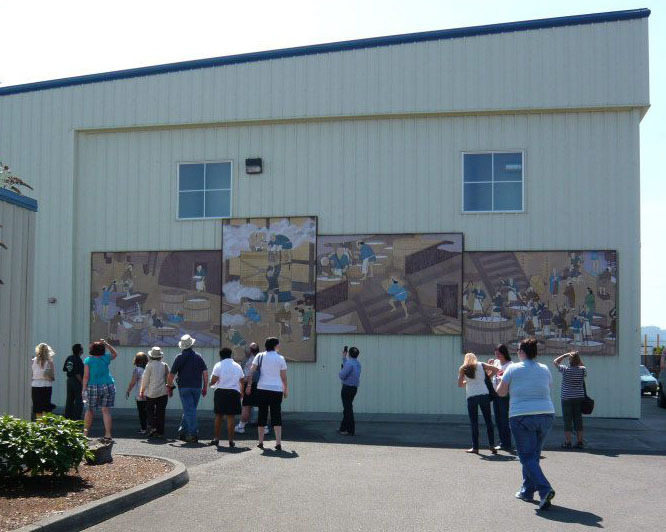 On August 15, some of us visited the SakéOne company in nearby Forest Grove. 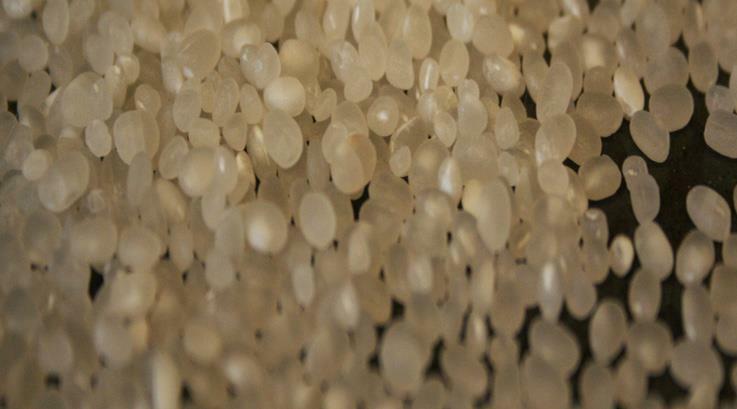 BETCHA DIDN’T KNOW: Saké is gluten-free and sulfite-free. It is treated as a beer (rice/grain) legally for distillation, and treated/distributed/served as a white wine legally and practically: it is about 12% ABV, chilled, and served in wine glasses. 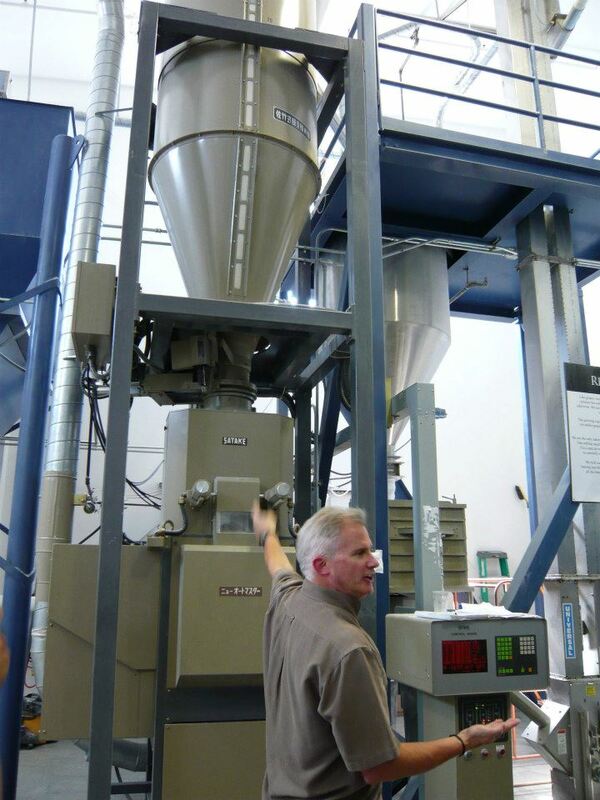 Steve Vuylsteke, President and CEO, SakéOne, led us on a tour of his facility. A native Oregonian, his family founded Oak Knoll Winery in 1970. 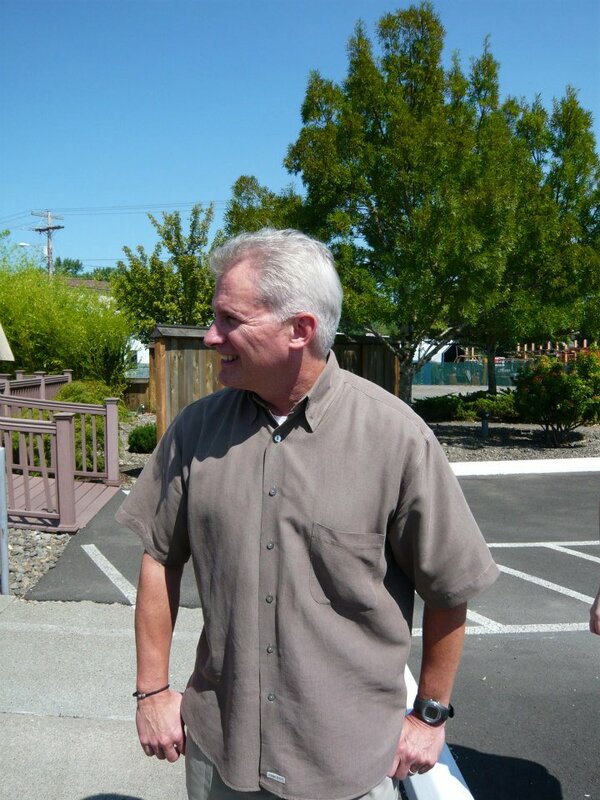 He has served as board president of the Washington County Visitors Association, the Washington County Winery Association, the International Pinot Noir Celebration and Oregon Pinot Camp. He has also served on the Willamette Valley Wineries Association, the Oregon Wine Marketing Coalition and the Salud Oregon Pinot Noir Auction. 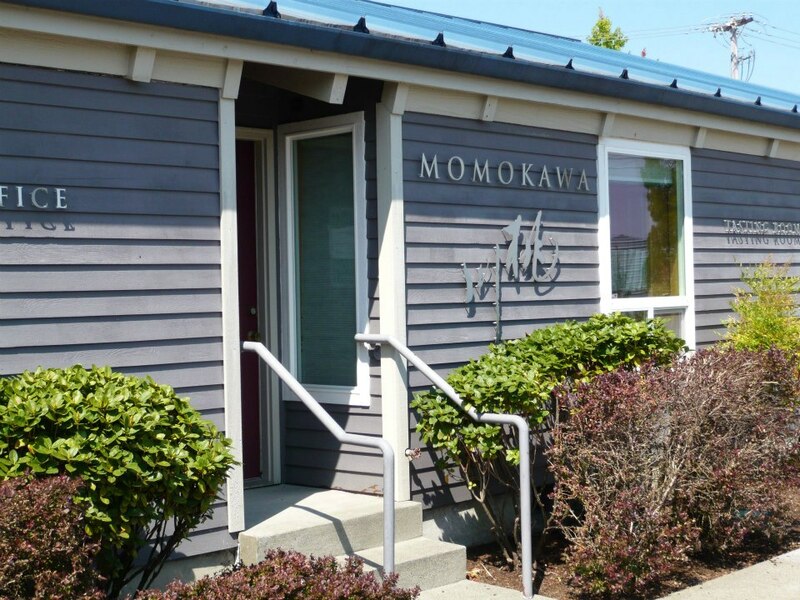 “Having witnessed the evolution of Oregon wine from an unheard of, unexpected regional product to world-class status, I am inspired by our opportunity to elevate Oregon craft saké to a similar status, one on par with the finest Japanese saké,” Vuylsteke said. Pictured here is America’s Sakémaster, Greg Lorenz, microbiologist. Greg didn’t grow up wanting to be a Saké brewer. “I’m a lab geek and come at it from the life-form perspective.” His life took him on a voyage through growing various microorganisms for food products from blue-green algae to tiny fish. His move to brewing Saké came one day when a former co-worker called and asked if h e’d be interested in giving it a try. So, he put on his best suit (he’d tell you it was his only suit and might still be) and landed the job. Nearly ten years later Greg is the “old man” of Americans commercially brewing Saké, but he’ll be the first to tell you he’s a beginner. Greg’s humble approach and lab geek focus has brought him the continued support of SakéOne’s original brewing partners, Momokawa Brewing Japan, and new support from the two master brewers of Yoshinogawa. 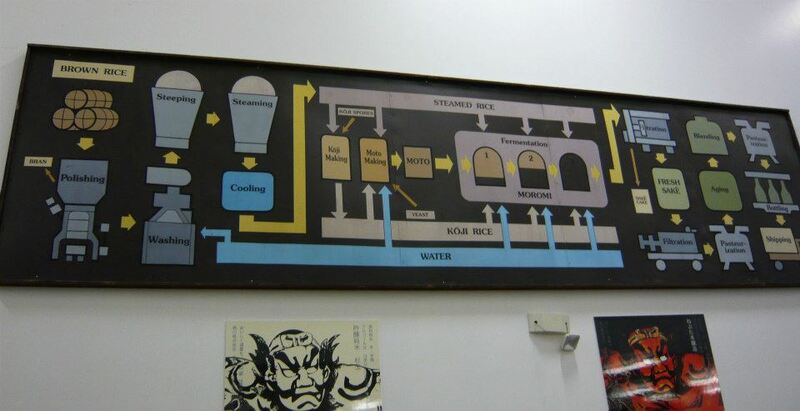 In the fall of 2010, the Yoshinogawa brewers spent three weeks in Greg’s brewery, working with him to enhance his processes from rice polish to pressing. The results were tasted with great enthusiasm four months later and the evolution in Oregon craft Saké continues. A delightful series of murals on the building’s exterior (above). Below is an informative chart from the SakéOne press package (on a Flash drive!) 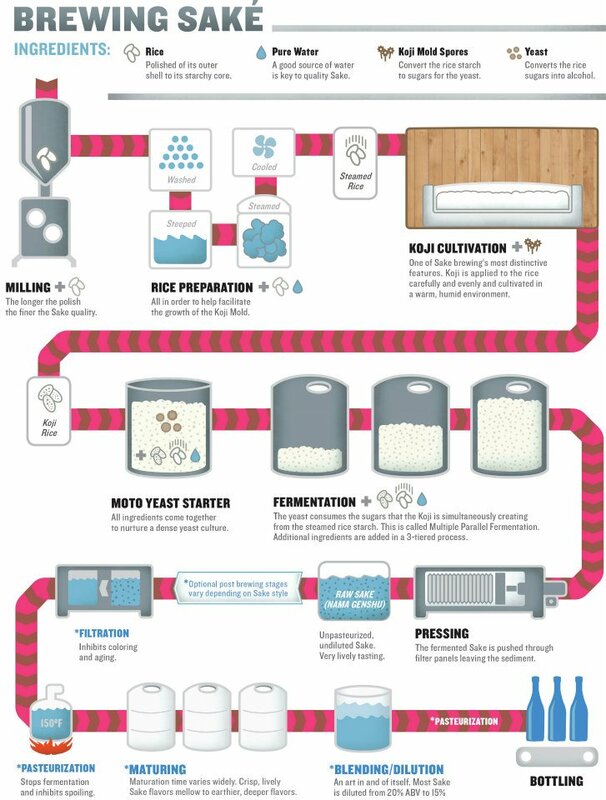 about how Saké is made. The next photos will bring some of the illustrations to life. Here are some bags of rice, sourced from Sacramento organic growers. Each bag weighs several thousand pounds. First, hulls are removed. 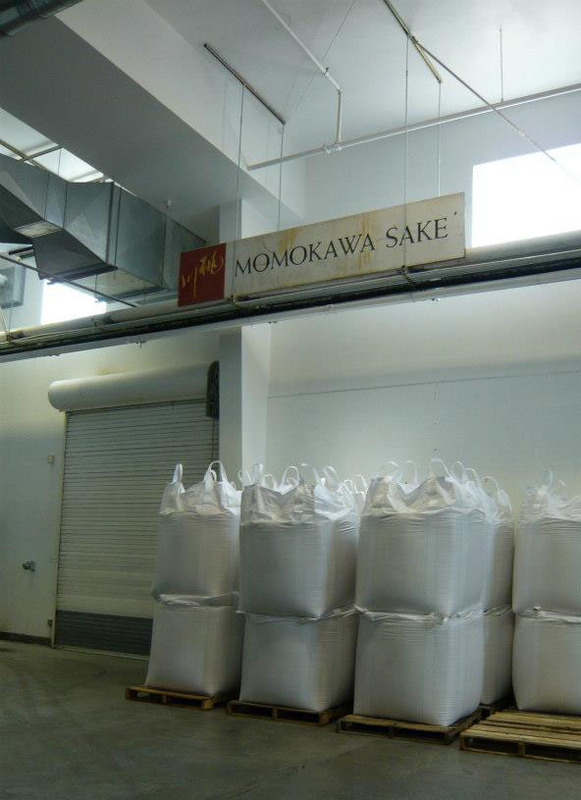 Each batch of Saké starts in the rice mill (above) where 40% of the grain is polished away leaving the cleaner starches found in the remaining 60% (Ginjo). 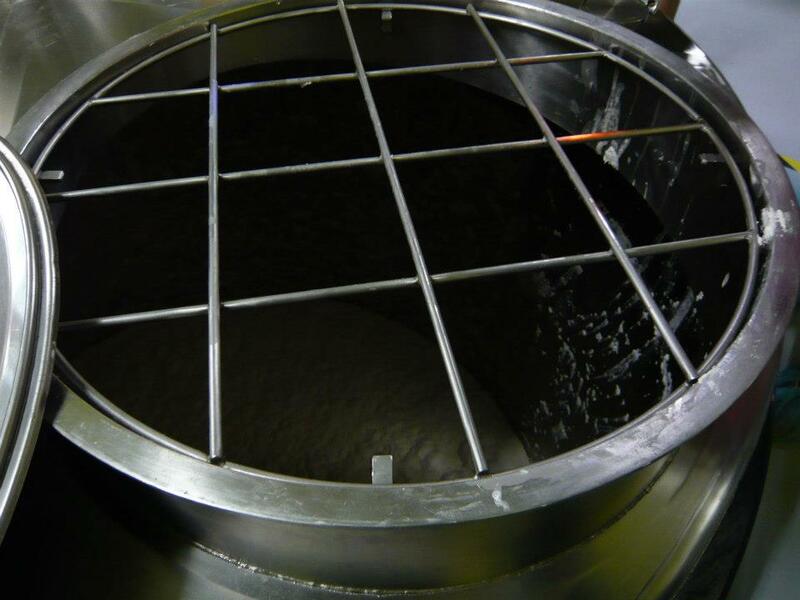 Koji is applied to the rice carefully and evenly and cultivated in a very warm environment. 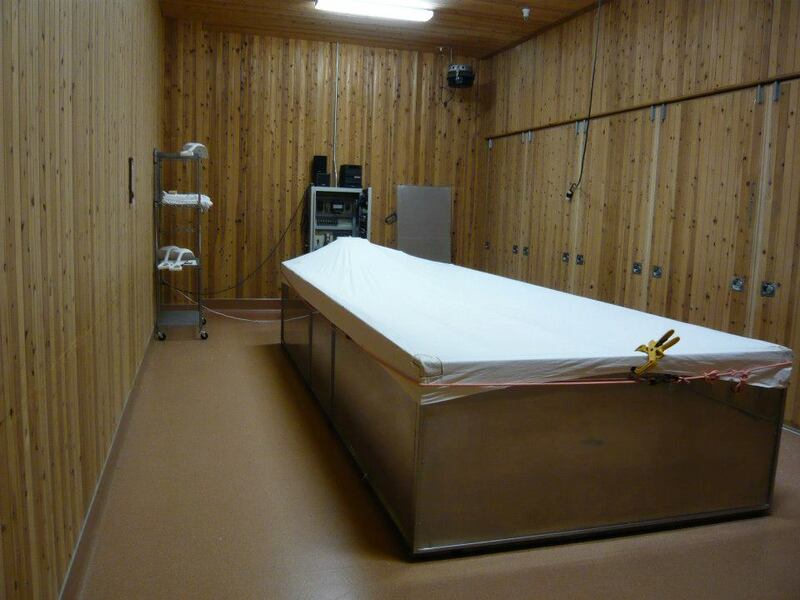 Note the cedar-paneled walls: Yes, it was as warm as a sauna in there. 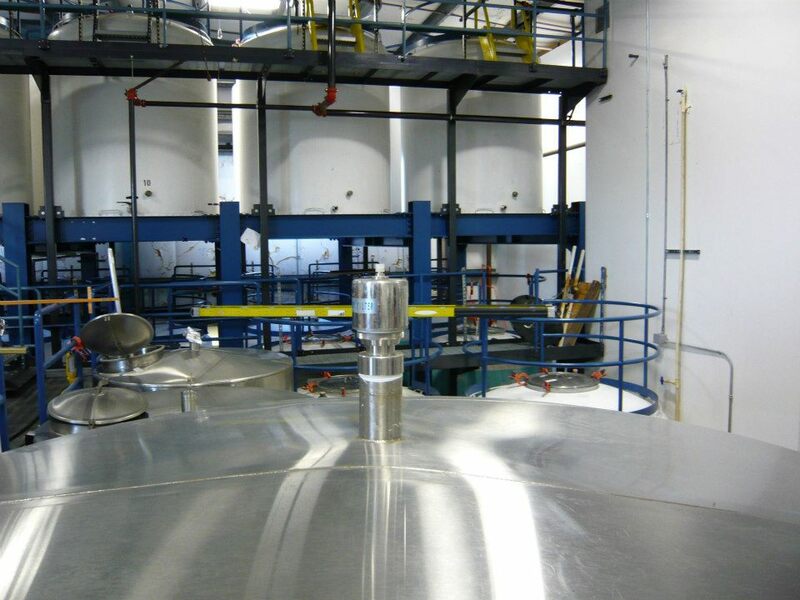 Prepare fresh yeast and get ready for the next step with a clean, empty tank. Note the blue “slippers” people are wearing in these photos. 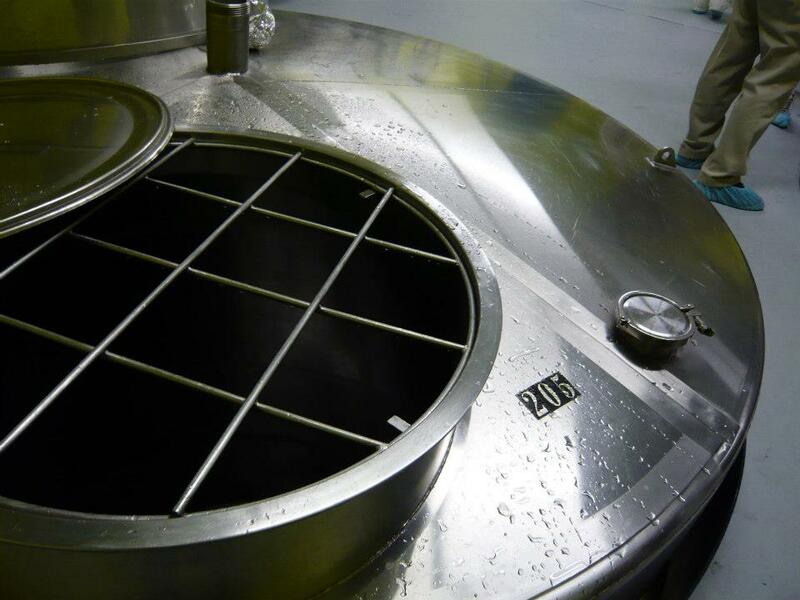 This is to help ensure cleanliness in the brewing process. 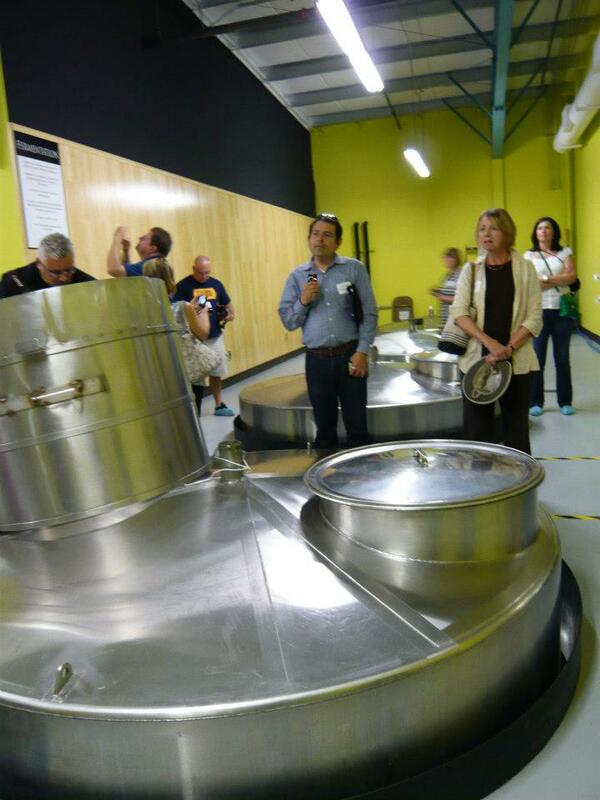 A room full of brewing tanks and wine bloggers. 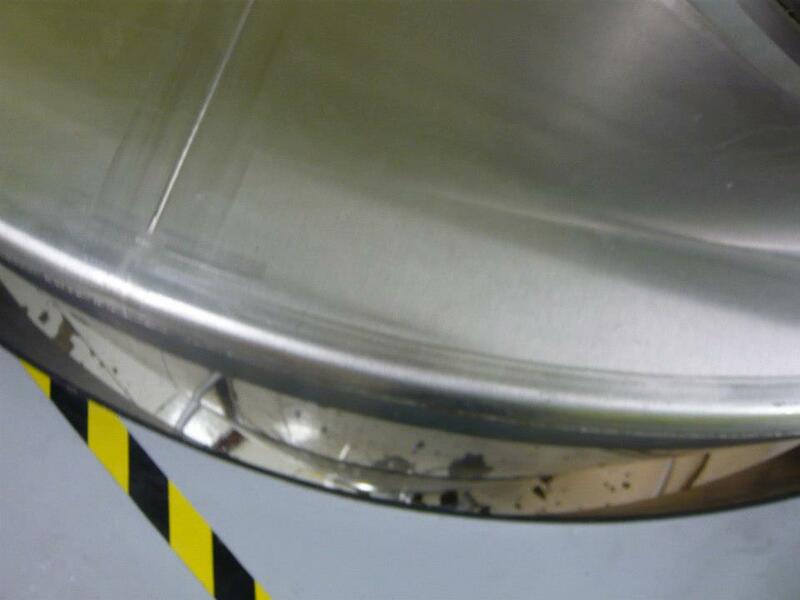 The tank’s contents are more visible in this photo. 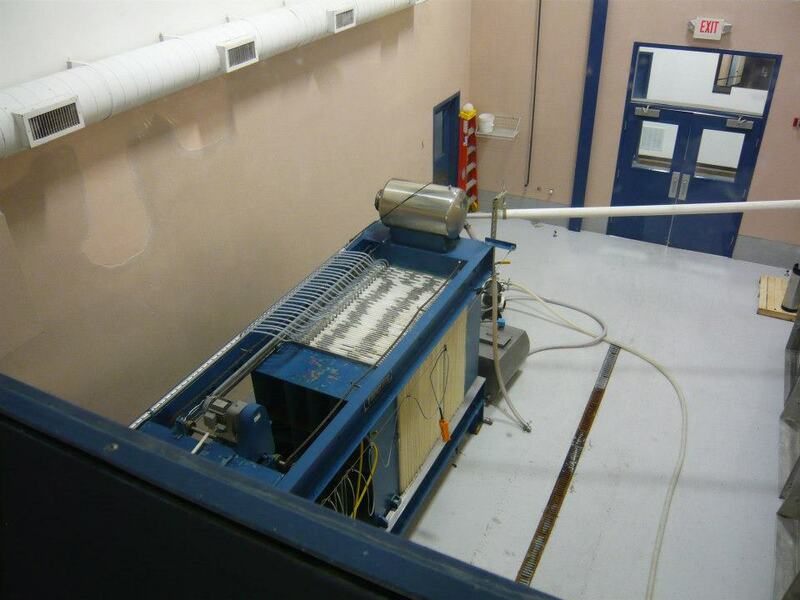 If you look carefully, you can see that the tank is set into the floor and extends down to the storey below. 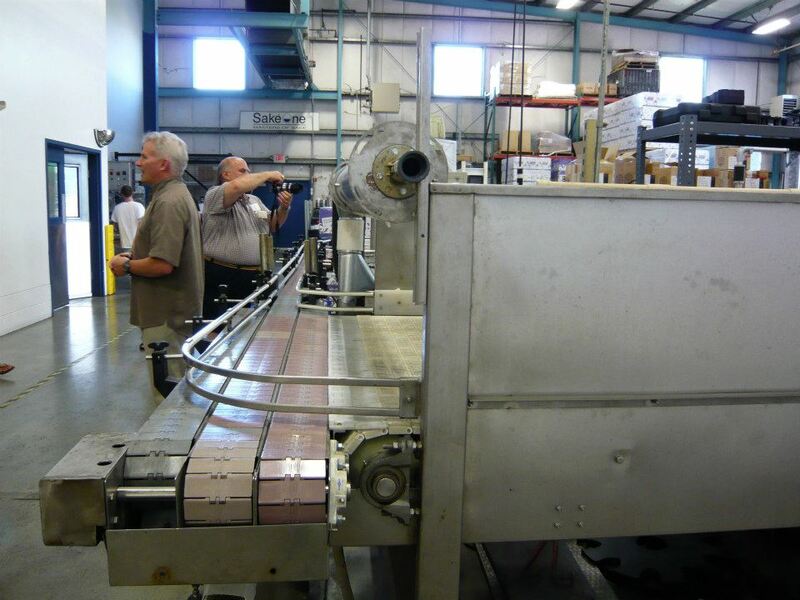 This is part of the bottling assembly line. And now for the extra-fun part: the tasting room! 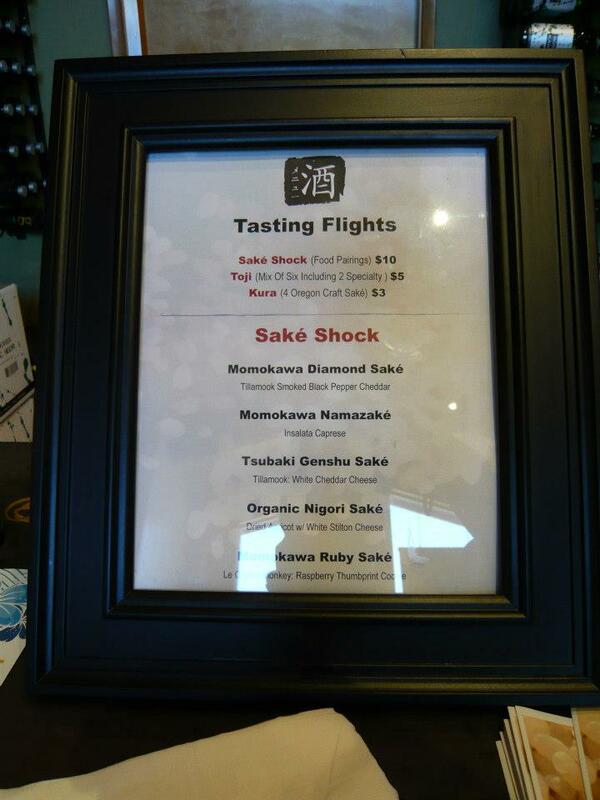 This is the list of Sakés we tasted. The Momokawa Namazaké was utterly delicious; organic and unpasteurized, it had whiffs of melon and almond. This was available only on tap, so I couldn’t take a bottle home. These are all served like white wine: chilled, in wine glasses. They are about 12-14% ABV, priced around $12/bottle. 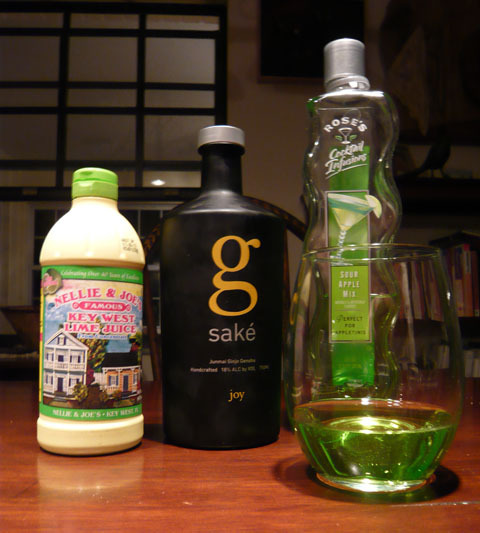 Gluten-free and sulfite-free, once opened, a Saké will last a couple of weeks in the refrigerator. Of all the SakéOne Sakés I tried (besides the one available on tap only), this one was my favorite and is HIGHLY RECOMMENDED. 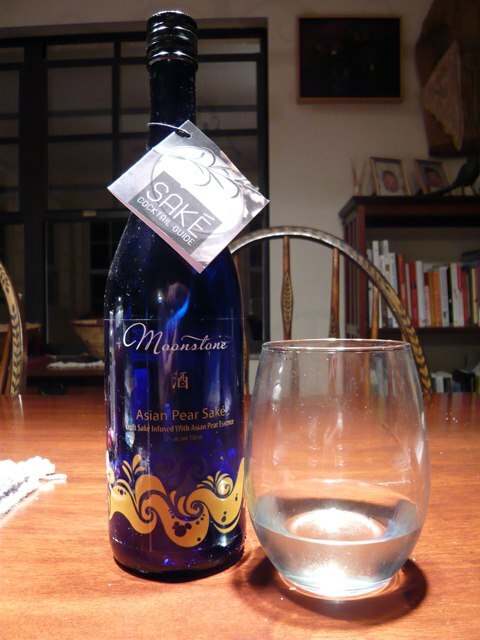 SakeOne Moonstone Asian Pear, 12% ABV, $12/750 ml. 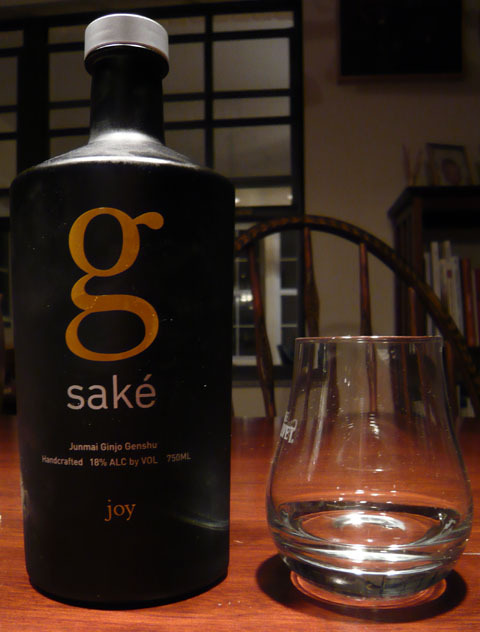 If you are a wine lover who has never tasted correctly made Saké, this is an excellent place to start. 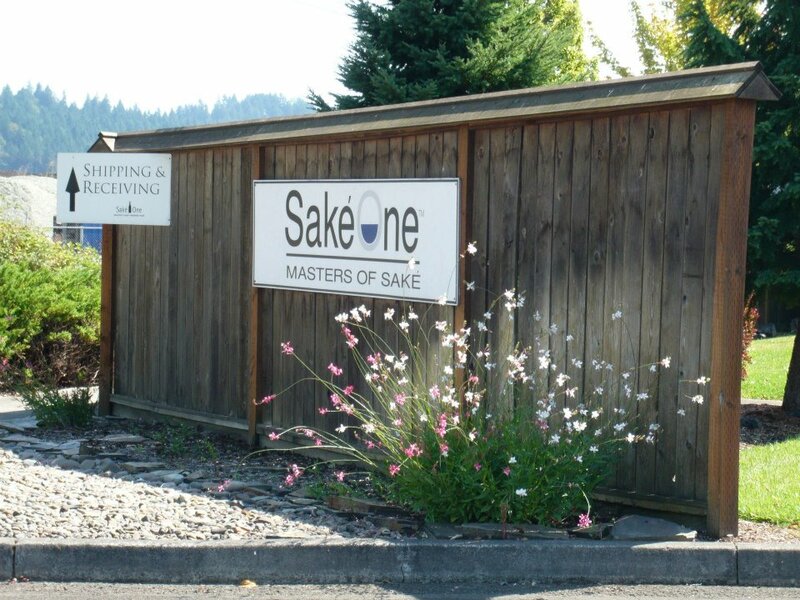 This entry was posted in Oregon, Saké, Tastings, Technical Stuff, Travel. Bookmark the permalink. Nice post and details. I was very close to joining this excursion but opted for Eugene. So glad I got to see your trip, looks like fun. Thank you, Shawn! I still have a whopping four visits to cover from the pre-conference Excursion alone. And then the King wine dinner and several other components of the conference itself that I didn’t get to last week. It’s a lot of work, but I can’t think of a better way to remember, and to share the experiences with others, than to write it all down! Are you going to Penticton?